The oldest lightbulb in continuous use was installed before the Wright Brothers took flight, is 110 years old, and is still as beautiful as the day she was born. In fact, it's likely the oldest electrical device in continuous use period. Take a moment and consider just how much the world has changed around this one, singular device. It was a hot summer evening in Livermore, California in 1901 and the band concert across the street was just about to conclude, but the fire captain had an announcement. The Fire Department Hose Cart House on L Street had just installed a new modern technological marvel, one of the first electric carbon lightbulbs in town and invited anyone curious to stop by and witness this new invention. This was the "Improved Incandescent Lamp" was the lightbulb of choice and it was an incredible design. In many cities the Fire Departments were motivating people to consider using this relatively new invention for safety. And of course this came by years of heartbreaking experience. A lost era when companies had so much pride about who they were, where they were and what they built. This amazing light bulb was invented by Adolphe A. Chaillet and manufactured by the Shelby Electric Company. The beautiful handblown glass bulb with a uniquely shaped carbon filament beamed a consistent ~10 watts (perhaps more). This light bulb has been turned on ever since, over 40,150 days. The only rest she took was for about 7 days during a renovation and the random power outages over the decades. She always woke up. You can check in on how she is doing, still proudly casting her light and reporting for duty for the last 110 years at this live webcam. 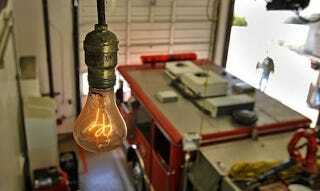 Known as the Centennial Light, the Livermore Fire department is really quite proud of the bulb and the built to last American engineering and manufacturing that went into it. Sadly Adolphe's superior lightbulb design and the Shelby Electric Company did not survive for a number of reasons. One of the many reasons tweets would not work in 1901. Some suggest that it was a plan of planned obsolescence that was taking over the industry that finally drew the end of Adolphe's design. Some may suggest that the Shelby technology did not survive because in some way it was inefficient or high wattage or bright light was not possible. This is not the case at all. When the Shelby bulb was installed in 1901 it was brighter than a standard Edison bulb. Shelby also had bulbs of up to 60 watts in 1901 with color tonality of light orange to almost bright white this was far better than any other product. Shelby was sold in a roll-up of a vast majority of Lightbulb companies in the United States. The National Electric Lamp Association a division of the General Electric Company purchased the Shelby Electric Company and with-in a year stopped all production on Adolphe A. Chaillet amazing design. The many advancements Adolphe made are lost to the sands of time. The exact processes may not have been saved, his knowledge is gone. Although there were three tantalizing patents issued in his life, they do not explain how he made his amazing carbon filament. What Adolphe really created was almost erased from popular history. Yet this 110 year old light bulb is proof of what one person can achieve. It's very existence proudly states, I am still here. It is proof that there is far more to all technologies than we can ever imagine. It is proof that true history matters. If only to pay tribute to the genius that got us so very far. This proud 110 year old girl elegantly reminds us of all of the past, present and future Adolphe A. Chaillet's of the world. My deepest wish is that this light never goes out and can be contemplated perhaps a thousand years from now. May she serve as a living reminder of how we can make even the most simple useful things heroically beautiful. The world may change and still she glows. What is the oldest lightbulb in continuous use? originally appeared on Quora. You can follow Quora onTwitter, Facebook, and Google+.